You may recall that last year the Form 470 contained confusing drop-down options for applicants seeking Internet Access services. Because so many applicants filed incorrectly, the FCC issued a blanket waiver for FY 2018 so last year’s applicants wouldn’t be denied for inaccurate Form 470 Internet filings. The FY 2019 Form 470 drop downs were modified slightly, but the confusion appears to be remain based on the Form 470 filings I’ve reviewed. I doubt the FCC will issue another blanket waiver for a second year. Therefore, it’s extremely important for applicants to ensure they have selected or will be selecting the accurate Form 470 drop-down item to be compliant with E-rate’s FY 2019 competitive bidding requirements. If you are seeking proposals for Internet delivered over Fiber Transport, you must select “Leased Lit Fiber (with or without Internet Access)” and then explain in the narrative that you’re seeking Internet and at what bandwidth. If you are seeking proposals for Internet via a different mode of transport (cable modem, DSL, etc. ), then you must select “Internet Access and Transport Bundled – Non-Fiber.” But be careful not to specify which transport mode you’re seeking. If you are seeking proposals for both Internet delivered over Fiber, AND a separate Leased Lit Fiber wide area network, you should create two separate services on the 470 and then explain in the narrative what exact services you want for each. Why? The “Leased Lit Fiber” service drop down option is now used for two things: 1) Internet Access service that is delivered over a leased lit fiber circuit, and 2) Leased Lit Fiber circuits – not including Internet — but you’ll want to make it clear to vendors that you’re actually are seeking proposals for different types of services. 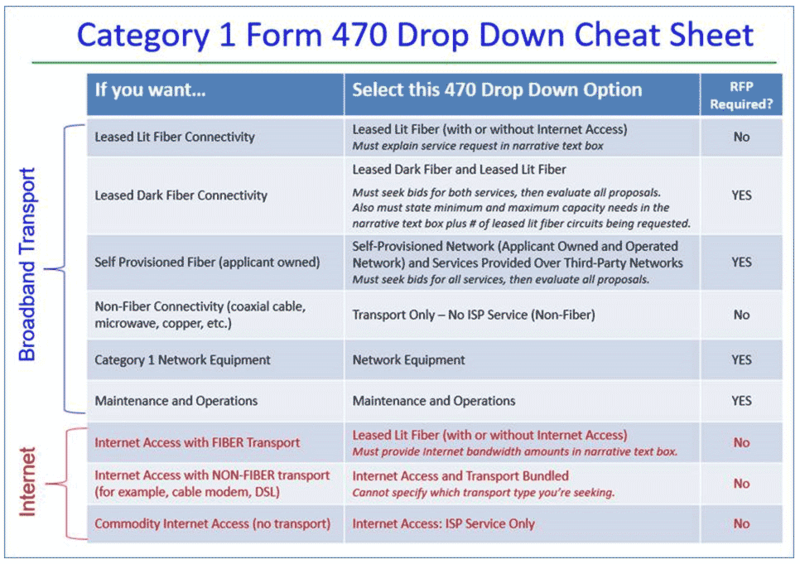 To help you decide which Form 470 drop down to select based on the actual service you’re seeking, I’ve created the following cheat sheet. Note that that transport selections are at the top of the chart and the Internet selections are at the bottom in red – but these are not the same order as you will see them on the actual Form 470 drop down list. For applicants who already submitted their Form 470 for Internet Access service and may not have followed these guidelines, I strongly encourage you to re-post your Form 470 and thus re-start your 28 day bidding period. Also, if you have questions about filing the Form 470 in general, please see http://e-ratepa.org/?p=27601 for a full list of changes/hints, a full Form 470 Filing Guide, and a status report of entities’ services ’ and whether they need to be rebid for FY 2019. Please feel free to contact me if you have any questions, as always.